There are quite a few almonds in here, probably more than I would have expected--and I'm glad. While small, the pieces aren't tiny; they're big enough that you can get the texture of that specific almond crunch. You can taste the salt fairly strongly, as well, which of course goes well with the almonds. 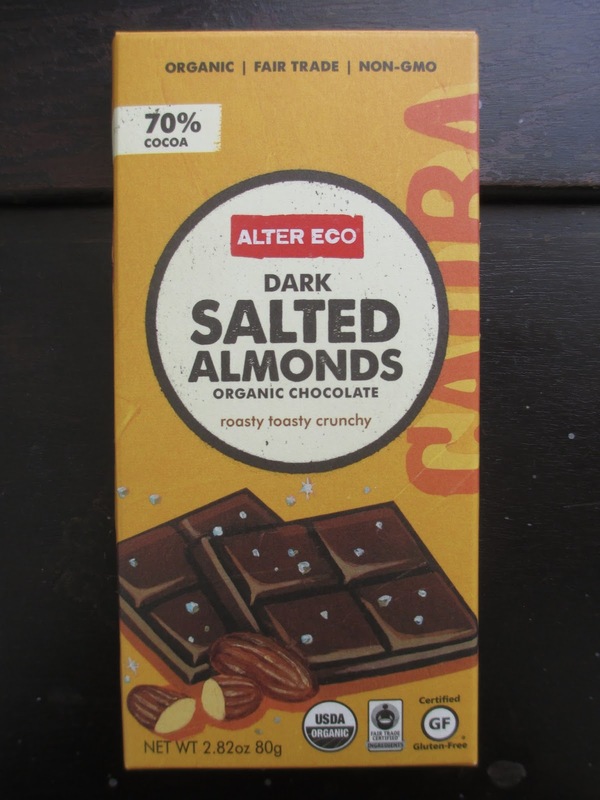 In fact, the salt plus the plentitude of almonds makes this chocolate a little reminiscent of a peanut butter cup. That's definitely a nice effect. 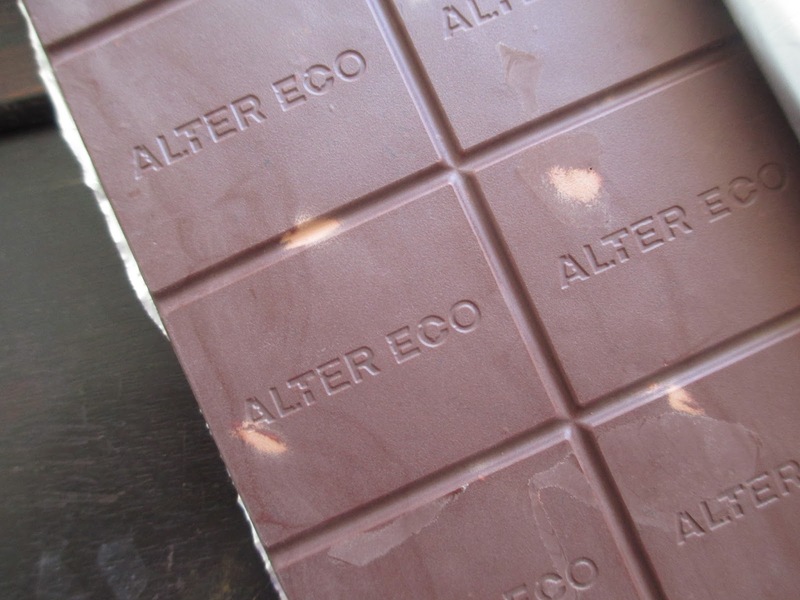 Of course, at 70%, this chocolate is darker than what you'll find in most peanut butter cups (even the dark chocolate ones are usually lighter, often significantly so depending on the brand). It can even taste somewhat unsweet at first--or at least that's how I generally feel when chewing on dark chocolate versus letting it melt. But once I moved on to the second piece, I had adjusted and the chocolate became a nice and consistent base element for the almonds and salt. Those took more of my specific attention. Once again, this was a pretty nice bar. It's good for snacking and munching. I want to call it something you could bring on a hike (almonds just make me think of hiking, I guess). Depending on the type of foods you buy, this can even be a replacement candy bar chocolate since it is reminiscent of peanut butter cups. Note that I use the word reminiscent loosely: it all depends what your taste buds are accustomed to. If you buy a lot of processed food and food with artificial ingredients, this probably won't remind you of peanut butter cups (not to say that you won't enjoy it--it'll just have a different effect). But if you're more into whole foods, this'll be a great indulgence. I'm starting this weekend's Memorial Day Sale early. 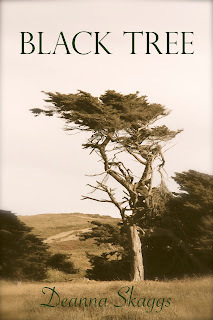 You can now get paperback and hardcover editions of my novel, Black Tree, for 30% off at this link. It's a good time to start stocking up on summer reading. The sale will continue through Monday. If you're still undecided, you can read the first chapter before you buy the whole book by clicking here. 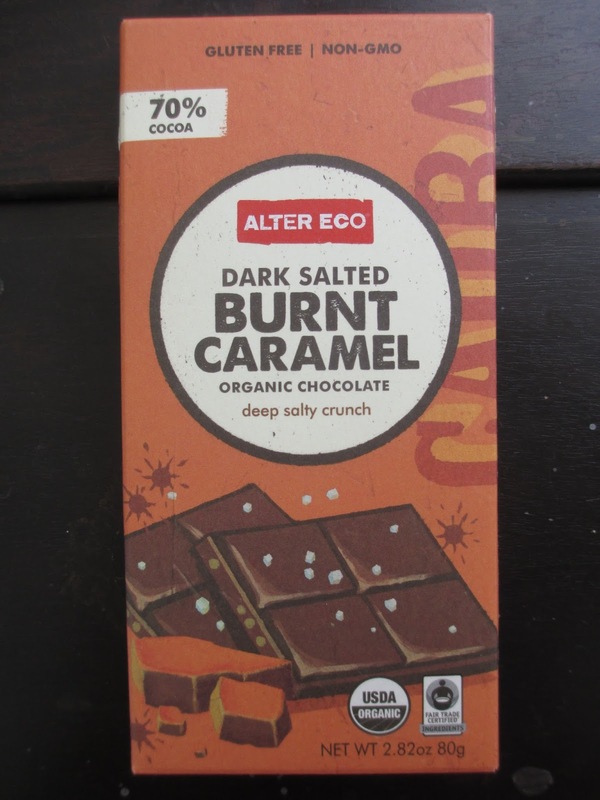 After enjoying the caramel truffle from Stone Grindz so much last week, I had to pursue more caramel with this Dark Salted Burnt Caramel bar from Alter Eco. Caramel, however, can mean many things, and this chocolate bar was completely distinct and separate. Once you unwrap the bar from the earthy orange card box and the silver foil, a wonderfully sweet and smooth caramel aroma emergences. It's reminiscent of the inside of a Lindor truffle--that same butteriness, just in smell instead of flavor. This chocolate has, as you can see, a standard 70% cocoa content, Ecuadorian in origin. The salt inside is specifically Fleur de Sel de Guerande. And it looks like the caramel is made with butter and cream, among other ingredients. You can see dots of the caramel on the front of the ten square bar, though not really on the back. And yes, in case you missed the "deep salty crunch" description in small lettering on the label, this caramel is indeed crunchy, almost more like toffee. Not the same texture as toffee, but more like that than like the usual sticky caramels. This is what they mean by "burnt" caramel. The first flavor to emerge is a little darkness from the chocolate; this isn't quite a bitter flavor, yet it is darker than what you might expect from a caramel chocolate. Then you start crunching into the little pieces of caramel and you taste the salt along with a mild buttery flavor. The effect of all the flavors isn't very sweet, and the salt is stronger than I'd expected. So I did find that I had to readjust my expectations. I had to get used to the idea of a toasted, salted caramel. This is deep chocolate, as well. And while I say that there was more salt than I'd been expecting, I don't mean that as a complaint. Lately I've been coming across salted chocolate that doesn't have enough salt, so this bar came with a welcome balance of salty flavor. It's still just one flavor note in there, nothing to overtake everything else--yet there is enough of it. Just the right amount. Now, while there are enough caramel pieces in the chocolate that you do get some with every bite and they do add a butteriness to the flavor, you can't expect them to affect the taste in the same way that a traditional caramel would. This is just a different experience. The chocolate provides a serious base and the caramel pieces add sweetness and a kind of milkiness--and the salt links the two together. I did need to get used to the effect at first, but once I did, I found this chocolate irresistible. 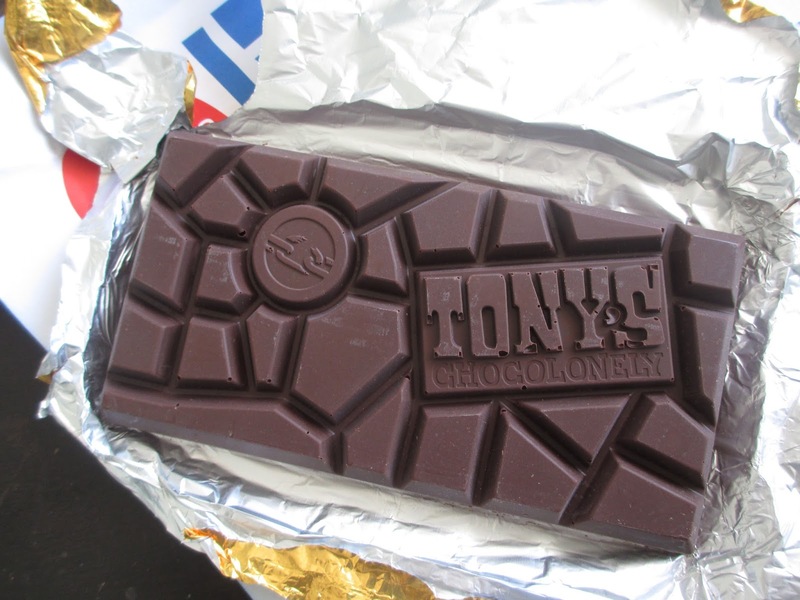 It's a unique chocolate--and yet one that doesn't feel odd or strange. The elements all feel familiar; they just come together in a singular way. The only other chocolate I can think of that was similar was Theo's Bread and Chocolate bar, which had salt in it and little pieces of crisped bread (instead of the toasted caramel here). Though it's been enough years since I had that one that I can't say how specifically similar these two bars are, I do remember loving Theo's Bread and Chocolate bar. I'm also hooked on this Dark Salted Burnt Caramel. 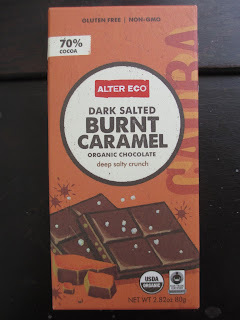 The caramel pieces mean it's a chocolate bar to munch through and chew (rather than letting each piece slowly melt), and both the salt and the caramel keep your taste buds asking for more. After my recent experiences with Stone Grindz Chocolate, I was excited to hear that they were experimenting with truffles. As this is still an early stage, I'm also not considering today's review a review in the usual sense. These truffles were nine dollars for a clear bag containing six truffles. That's $1.50 per truffle, which is about average or a little less than average; I would say the average price of a truffle is about $2 or $2.50, but these truffles are also a little smaller than average. The style is simple and sleek. The round shapes (small half domes and short cylinders) are Dark Chocolate Ganache and the squares (these also came in rectangles) are Sea Salt Bourbon Caramel. Beautiful shapes and the chocolate looks healthy. There is some imperfection to the squares, with some chocolate spilling from the edges. Not much, just something to practice getting perfect. I was admiring these truffles so much in the bag that I had perhaps forgotten they were more than just a visual item: I was pleasantly surprised at the wonderfully rich and elegant chocolate smell that came to greet me when I finally opened the bag. This shouldn't really be surprising, though: I had plenty of positive comments for Stone Grindz's plain chocolate bars. Starting in on one of the plain truffles, you can see that it is a little uneven. One edge is thicker than the other, and the bottom is perhaps thicker than it should be, as well. (I do often have this comment about truffles in general.) Still, these details mattered little or not at all as far as taste. This is a rich, good chocolate with warm flavor. The ganache adds sweetness to it all and some creaminess; its flavors are still based on those of the chocolate. This isn't a really dark, deep, bitter chocolate experience; it's just dark in the approachable sense, something nice and rich. Likewise, I can't exactly call it sweet yet neither is it unsweet. This is a solid ganache truffle; I would buy it again. Now on to the next one. The caramel is free-flowing, which I normally wouldn't try to cut open to photograph because that usually just makes a mess. But I did abuse this truffle just to get a picture of the color and consistency of the caramel. As you can see, it has a sort of dark orange tone and it is definitely free-flowing. I always seem to hesitate around caramel in this type of setting. I like caramel; I just think of it as working more in a confectionery sense, with desserts and ice cream and such. I always think that it won't be good enough for a truffle setting. But I tasted a touch of this caramel that had spilled out, and it was wonderful. It captured me right away. I should here note that I had forgotten the exact flavor of the caramel while I was tasting it; it wasn't until later that I went back and saw that it was sea salt bourbon caramel. So here is what I found in the flavor without realizing all that. I found just the right amount of light sweetness and a honey taste, completely with its own richness, just a bit of vanilla, and some of the expected "caramel" flavor. And also the right bit of stickiness to the texture. Biting in, I tasted chocolate and cream and vanilla. The chocolate felt darker and plainer than in the ganache, which made a good match for the caramel here. I wasn't finding the regular caramel flavor here; instead, I found an amazing flavor experience that I only wanted more of. It's the bourbon, of course, that gives the richness I detected. It really does elevate the flavors in just the right way to make this truffle fresh and exciting. While I certainly enjoyed both truffles, I did find myself liking the Caramel one more simply because it was unique. I've had good plain truffles before (though I don't want to make light of that fact because I do appreciate finding more) but I don't recall ever having a caramel that was quite like this. So this was an experiment? Well, then, congratulations is what I have to say. These are already better than some of the truffles I've bought in established stores. Stone Grindz is starting with a good chocolate to begin with, so that already helps a great deal and sets them ahead. That's why the plain ganache turned out well. And then the caramel was a great way of offering me something a little familiar yet so much better than what I might have imagined. Dark Chocolate Ganache and Caramel were also two good flavors to start with: they're popular flavors, with one sounding a little richer and one sounding more casual but with both offering a great flavor experience. I collect a lot of used books centered around the Southwest. That's nothing unusual, so neither was Grandmother's Grandchild: My Crow Indian Life by Alma Hogan Snell (edited by Becky Matthews). This is the story of a Crow woman from Montana (she was born in 1923) who was raised by her grandmother in traditional ways but also grew up in the increasingly modern setting of a twentieth century reservation. And it's also probably the best of this type of book that I have read, which is the singular trait. I like hearing people's stories. I'm a listener (this is why, though some people might call me quiet, I get along with talkative people: I genuinely like to hear what other people have to say). So while I don't read many biographies, I love autobiographies (if they're centered on a topic, setting, or person that I'm interested in). Alma's autobiography is the best of listening to a wise, elderly person speak of her life (this book was published in 2000, so she was 77 at the time). By the way, her aforementioned grandmother was Pretty Shield, who gave her story to Frank Linderman to publish, so you may be familiar with Pretty Shield's story (I wasn't, but I would definitely like to get that book in the future, as well). The greater part of this book covers the time when Alma was young, say under twenty, although she does also describe the main events of her adult life. So you see quite a bit of the 20's, 30's, and 40's, that time when so much was changing. Because Alma was raised by her grandmother, she learned traditional ways of gathering food, preparing hides, and respecting the earth and all living things--more so than if she had been raised by her parents or if (like her older siblings) she hadn't been constantly by her grandmother's side. So you get quite a bit of cultural info that is interesting and the type of thing I had expected to find in this book. The narrative reminded me a bit of Little House on the Prairie in some of the earlier chapters: they're both stories full of descriptions of a fading culture, stories attempting to preserve awareness of the past and the people of the past. Alma speaks always frankly in these pages. She says what she thought and what she thinks and why. She explains all sorts of things, as well, personal things that she could have glanced over but instead chose to delve into because including such details and incidents makes the story whole. As we get into her adult life, there is some dark content. Yet because she includes all of this, we believe what she says and we believe that it's true. Alma also talks quite a bit about faith. She explains how the missionaries started churches on the reservations and her grandparents were the first to be baptized in that community. So while they still kept their culture, they moved away from other things that they had once held onto (Alma refers to her grandmother's "Crow powers," which she was at first reluctant to give up). Alma talks about how they already knew that there was a creator, so that was easy to accept. And she also explains their way of accepting the story of Jesus (they called him "The One Pierced in the Hand") as a warrior who gave himself for his children, explaining that everything about that story made sense to them and their concept of what was good. This was all fascinating to me; it reminded me of Emeth in The Chronicles of Narnia. And then also you have people who were used to believing in what you could call the supernatural, if that's even the right word--and therefore their faith was strong and accomplished things. There are some great stories in there. Alma watches her grandmother stay outside of the storm cellar, lifting her arms to the sky and praying to God to let the storm pass over their house because her grandchildren need it--and then the violent storm completely passes over their house. Or Alma's own stories about praying for healing for people who were sick or injured. Or when she was about to have surgery to remove a tumor; that was a great story. So you can look at this book as being about the intersection between two cultures. But whose life in this land in the past two hundred years hasn't included the intersection of at least two cultures? (I don't mean to say that Alma wasn't in a specific intersection or to lessen the cultural place that she was in. I'm just saying that these types of themes and concepts are what come together to make real people.) I just loved all of the things that this book offered: the cultural and historical descriptions, the discussions of faith and examples of its influence on life, and the depictions of different kinds of relationships between people. If you're interested in any of these things, then definitely read this book.